From the team that brought you FABLES: THE WOLF AMONG US comes a new chapter of the FABLES legacy! In a post-Fables world where magic abounds, it can be wielded for the greater good or used to plant the seeds of anarchy and terrorism. The Shadow Players are a global network of agents-both Fable and mundane-tasked with policing a newly enchanted world and protecting humanity from itself. 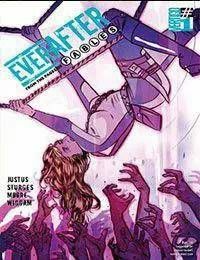 EVERAFTER features the return of series favorites Bo Peep, Peter Piper, Hansel, and Connor Wolf, as well as exciting new characters and a terrifying new villain! Written by FABLES: THE WOLF AMONG US veterans Matthew Sturges and Dave Justus with gorgeous art by Travis Moore (Fables: The Wolf Among Us, JLA All Stars), you wont want to miss this series that FABLES creator Bill Willingham himself told us we had to get into your hands as quickly as possible!